The few times that I have taught the introductory survey in Canadian history, one of the issues that students have struggled with is the Quiet Revolution and October Crisis. There are a few reasons for this, including that I teach in Ontario, where Quebec history doesn’t get a lot of coverage in high schools. A much larger issue, though, is that the October Crisis can be inherently confusing as there are a lot of moving parts, from the kidnappings to the War Measures Act to the larger ideological shifts in French Canadian culture. Trying to piece all this together as part of a broad survey can, as a result, be challenging. 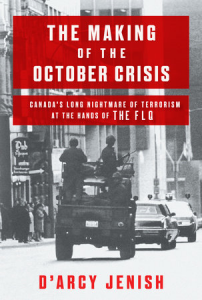 In his new book, The Making of the October Crisis: Canada’s Long Nightmare of Terrorism at the Hand of the FLQ, D’Arcy Jenish provides a very useful overview that not only uses new material to explain what happened, but also explains the connection to today. A journalist and author of a variety of non-fiction books, Jenish makes great use of oral history in telling the story of the process that led to October 1970. When reading the book, Jenish’s journalism background comes through clearly as he weaves together a narrative that is engaging, clear, and informative, that has received a number of positive reviews. In this episode of the History Slam, I talk with D’Arcy about the book. We talk about his approach to the subject, the historical literature on the October Crisis, and the FLQ’s rise. We also talk about terrorism, the linguistic divide, and how the book connects past and present.